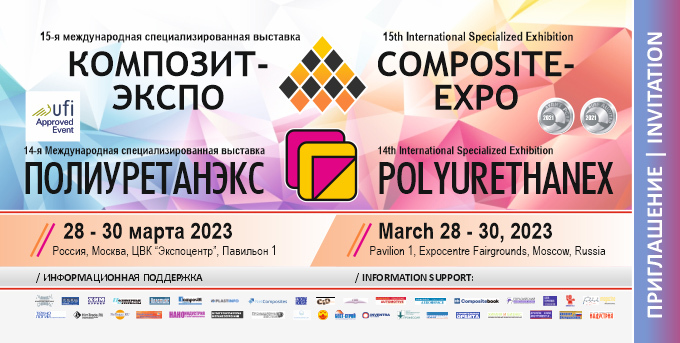 Wide introduction and application of innovative technologies of composite materials manufacturing and introduction. In 2018, on the space about 7000 sq. m. there situated 201 exhibitors, including 120 national (domestic) companies and 81 foreign ones from 21 countries. Over 15600 people visited the shows and 93% of them were specialists in different fields of industry. It witnesses growing demands of the Russian market to use modern innovation materials and technologies in different industries. It witnesses growing demands of the Russian market to use modern innovation materials and technologies in different industries. Aeronautic, Aerospace, Defense, Automotive, Construction, Wind Energy, Civil Engineering, Railway, Consumer Goods, Electronics, Boat & Shipbuilding, Medical, Sports & Leisure. - Sealing and adhesive compounds: melt adhesives, polyurethane adhesives, hybrid sealants, epoxy adhesives, constructive adhesives, etc.